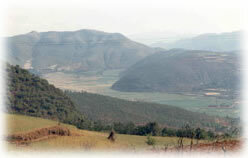 Several narrators emphasise the demanding nature of their environment, which requires more skill and hard labour than farming on the lower slopes or plains. 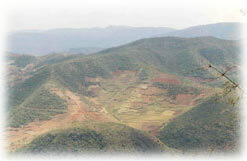 "This area is high and cold… In other villages, people can yield much grain from one day's work. Here, we work many days but still cannot yield as much as theirs… You have to seize the season, because in this cold mountain area, the frost is heavier. If you plant it late, you'll have no yield. Frost comes even in August and September" (China 24). Few mention changes in climate. Some remark upon a reduction in water supplies, which they relate to deforestation rather than significant changes in rainfall patterns. Indeed loss of tree cover seems to be the most significant change to the environment - almost all narrators express concern about it. Some they attribute to the building of roads and clearing of land for cultivation; the rest to people's need for firewood and building materials. The latter seems to have accelerated recently. New roads have increased access to wooded areas and more importantly, changed the scale of deforestation - by enabling people from the plains to come in lorries, and so take away many more logs at a time. Several make a connection with deteriorating rainfall and water sources. A Miao doctor (China 12), working away from her home village, expresses her shock at the dramatic loss of trees she found when she returned home recently: "In our place, when we were young, trees were everywhere. They were so many that you couldn't get through them… I went [home] twice this year. I felt such sorrow when I saw the mountains. It was as though they had been cut by a sickle, not one tall tree left…People are rich but the resources are used up" (China 12). In contrast, another woman explains that her local environment is benefiting from their improved economic situation: "In the past, we had no food to eat. If a person didn't cut down some wood to sell, what could he eat?… Now we have a better living standard; we ourselves plant trees" (China 25). "I see that the trees on the mountain are disappearing. Our generation almost does not have firewood. If we don't manage the forest well, what firewood would the next generation use? We would have no charcoal to burn either, nothing. And the cogon grass cannot grow now. Without cogon grass [for thatching], what can ordinary people use to build houses?" "Don't you see that every mountain is barren? It's because there are too many people. Forests are not managed well. More people need more firewood, but trees won't grow in one year. Now even the cogon grass [for thatching] doesn't grow… Not to mention the next generation, even this generation doesn't have the grass to cover their roofs…"
"In the beizi (plains), there are large plots of paddy, while in the mountains the plots are mostly fragmented and small… In the beizi, whatever you plant, it yields; while in the mountains, it's harsh for any planting, the land is infertile." "I'm a dying person but I'm still thinking about the mountain and water…Now the forest is cut down, and the water source becomes weaker and weaker. How can our children farm the land in the future?" "I feel [this] isn't the place I used to live in… Down there… were two big ponds, and the upper places were very good too. They have dried up now, probably because the trees are cut down… In the past, up here, this flat land was all water. The water was so deep that the buffalo could drown in it." "There were tigers and leopards in the mountains but they were hunted off." "At that time [when I was young], you could hardly see stones exposed on the slope [for the trees]. Now, it has become barren. There are no trees. Nothing. No resources but just a cold mountain area."